In collaboration with Film Shooters Collective, Blue Moon Camera is proud to host a collection of the best work done by the members of FSC. FSC came into being in 2012 as a space for analog photographers to share experience, information and work in an open and inclusive community. Blue Moon Camera first opened its doors in 2001 as a haven for film photographers in Portland, Oregon and beyond. 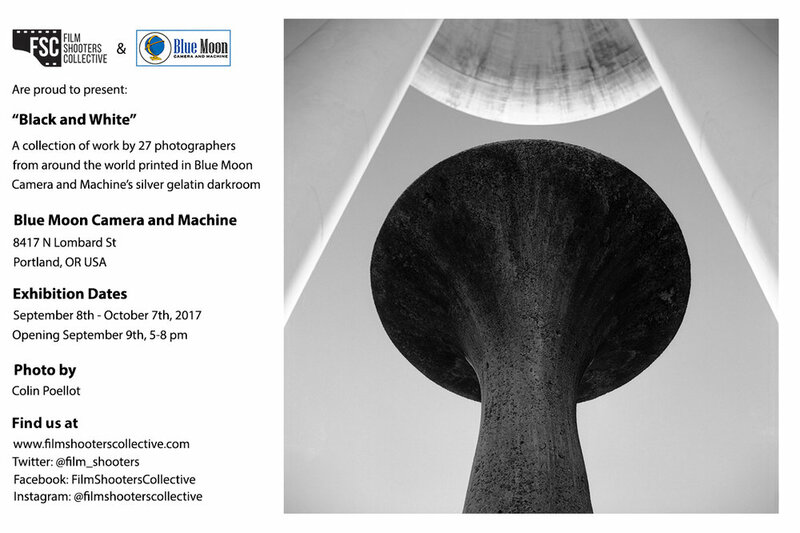 Curated by BMC, this black and white exhibition features work by 27 analog photographers from around world printed in the Blue Moon Camera silver gelatin darkroom, one the world's last remaining optical printing labs! Join us for the opening on Saturday September 9th from 5-8. Meet the folks of Blue Moon Camera and the Film Shooter's Collective and expose yourself to the beauty of traditional black and white printing combined with analog photography. Opening Event: "Shot on Film: The Best of FSC"